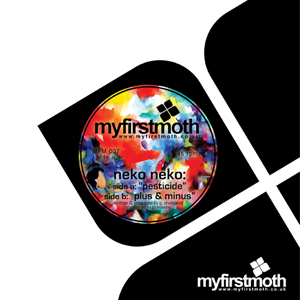 Debut 7″ from Neko Neko released by My first Moth records, featuring Pesticide on the A and Plus & minus on the B side. Selling out at Piccadilly records shop on the first day, Piccadilly staff pick and charting on Juno be sure to get this before it sells out. Available in all good independent record shops and online retailers, on import in Europe, Japan and USA. This guy is great! He really reminds me of some of RJD2’s early (and best) work but with less samples and more instruments. I hope he’s working on an album because i’d love to hear more music like this! This new Neko Neko record could easily be used as a movie soundtrack. It also reminds me of an era of music based on heavy drums and melodic samples, the kind of record Mo’Wax would’ve loved to release back then. Neko Neko lays down a wonderous cinematic trip that brings to mind Roy Budd’s wonderous compositions, the spiritual harp of Dorothy Ashby, wigged out drum patterns and that’s only the first track!!! This highly recommended 2 tracker sidesteps the usual ‘beats’ cliches and lays down a progressive take on musical beauty but more than manages to stay funky fresh too…More please!! !